Thank you for all your help, I think the course was fantastic and I really enjoy it. All the instructors very professional and the approach to the candidates was very individual, I felt like it was a course just for me. We will definitely see you soon! My wife and I qualified and Open Water Divers with Oceandivers a few years' ago and I couldn't recommend them more. Very professional outfit, took us through the training at our own pace and we both found the skills they gave have stuck with us over the years. I'd encourage anyone looking to take up diving in Ireland to use them. I am new to scuba diving. I was well taken care of for the orientation diving. Thank you very much!! 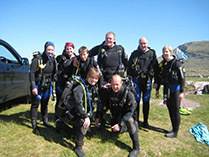 They are a wonderful bunch dedicated to making scuba diving enjoyable to all. Thanks Oceandivers - Brian, Susan & Dan, & all the divers for a fab weekend! I miss Tuesday nights at the pool with my dive family!! It's hard to capture what a great time you can have and what a fantastic bunch of people you all are, you've done an amazing job. Guys – can you please share my sincere thanks to Brian, Susan, Ian and Rob for putting through a fantastic schedule in Valentia this weekend. The organization was fantastic, the schedule went like clockwork and while I can’t speak for everyone I’m pretty sure that everyone had a fantastic time. Now I just need a week in the office to recover. Thanks again! Wow! What a way to spend a bank holiday weekend! Just back from an incredible dive on the Skelligs with thirty metres viz and oodles of life!